Hiring a top UX designer builds the basis and foundation of defining your product into a meaningful experience and also into a functional product. Although this can be a challenging phase of the development journey, it is also the most important as you set out to harmonize your product goals, business objectives, and user needs. This article looks at understanding the key roles of a UX designer within your business as well as the skillsets required to successfully build your product. Toptal is a marketplace for top UX designers. Top companies and start-ups choose Toptal Web designers for their mission-critical design projects. Natalia is a user experience designer and researcher with nearly seven years of experience creating web and iOS applications. Most of her experience comes from designing large enterprise software and SaaS web applications, where her analytical, design, and user research skills are put to work. Maureen has been a UX architect for 14 years and has experience with websites, web-based applications, kiosks, widgets, and mobile interfaces. She’s also good with content and data. She believes that all users' needs matter—even the edge cases—and she prides herself on tenaciously finding usable and scalable solutions to complex problems. Right now, she’s playing with prototyping tools, eager for what they bring to the table. Jeffrey has been working alongside entrepreneurs to help build their businesses for more than half a decade. Most recently, he has worked with a digital agency in London called Grampy. For those two years, he traveled the world consulting with C-level executives and building digital experiences for leading brands. Fabio is an experienced product designer who's worked with venture-backed startups and enterprise clients like Google and Viacom. He had been searching for more projects that piqued his interest so he made the decision to try freelancing platforms. At the time, there were many to choose from, however, Fabio chose Toptal because he not only wanted more work but also solid clients and teammates to work with. Alexandra has over eight years of experience as a UX designer in four countries. She has partnered with both small startups as well as innovative, market-leading blue-chip brands at both top-line strategic and granular levels—including Johnnie Walker, Waitrose, Barclays, Weetabix, KFC, World Animal Protection, and more. Most recently she has been working extensively with software market leader Atlassian in San Francisco. A self-employed UX designer and developer, Tamara spent several years at Google, first as a UX manager in Ads (DFP), and then as UX design lead for Google Classroom. She has crafted experiences for Apple (apple.com redesign), The Paperless Post, Conde Nast, and The New York Observer (2009 Webby nomination, best newspaper). Tamara is an adjunct professor at FIT, teaching interaction design, and holds a Master’s from NYU’s ITP. If you are looking to hire a UX designer, it means you are about to embark on a life changing journey or are in the throes of saving lives while trying to keep the boat afloat. Either way, when something needs to be built or has to be fixed, the trail of gingerbread crumbs comes back to the cradle of design: UXD (user experience design). This phase can wear many hats and can go from truly enlightening to astronomically daunting. This is where the difference between producing a truly meaningful and viable product that transcends the connections between life and technology itself can also meet complete oversights, where requirements are thrown to the wind and the steady foundation required to keep all the supporting pillars at their best can come spiraling down. In order to get the best out of the UX designer you will be working with, it is best to get a little closer to what they do and how they do it. In this article, we’ll take a quick look into what it entails to successfully identify and hire the best UX talent for your project as well as come to grips with the intricacies of the UX designer job description, framing UX-based interview questions that matter and understanding terminology and processes. Understanding what actually defines user experience (UX) design is a debate that has raged on for decades. What makes it somewhat elusive is that it evolves with needs, be it technical, human, or environmental. In the Fast Company article The Intricate Anatomy of UX Design, an idea of the range of disciplines UX design brings to the fold can somehow be understood. In this case, we will be looking at the practical or functional sections of UX design that encompass the lifecycle of a digital product’s journey, in essence, what is UX design, and how can you use it to build your business and its products? UX designers are primarily concerned with how the product works and feels. A given design problem has no single right answer. UX designers explore many different approaches to solving a specific user problem. This can range from solving highly technical product issues to meandering the intricacies of user behavior and solving the core values and the fundamental purpose of a product and its relationship to the user as a whole. Identifying requirements is a phrase you’ll come to endear; at this stage, it is paramount we understand what it is we will be requiring from our UX designer, what to look for in their UX design portfolio, and in what form, as the lines between philosophy and practicality can be blurred. In the aim of getting the best out of the experience, a healthy balance of tangible production deliverables as well as some credible research and strategy is key. There’s a lot to consider when you’re laying out the starting point of your project. This seemingly would be one of the most important sections of your products journey outside of financing as it sets the intention and defines your goals and clarifies your objectives. Benchmarking targets and setting key performance indicators on relevant sectors of the business—be it acquisition and/or customer support and retention as well as defining user experience strategy and roadmaps for the project’s ensuing lifecycles—can also fall into this phase. So if you’re hoping to define your idea/product into a viable product and take it into production as well as get it vetted and approved for funding, this would be the best place to to start. Once you have your technical requirements and user needs bolted down, the next phase moves onto defining those outcomes and sometimes hypothesis to environments that let you physically see how it all comes together. This is a hugely reiterative process moving from low fidelity sketches all the way to high fidelity prototypes as you test and redefine. In this space, make sure to identify that your UX designer is indeed familiar with the tools and the production deliverables expected from them as they turn research to tangible wireframes and prototypes. Missing this step leaves the user interface (UI) designer either using visual design solutions to vet unexplored usability patterns or having to wear both hats in the same time frame they have to focus on their physical design deliverables of the project’s cycle. This phase will be your most crucial, production-wise, as it affects more than just the UX vector and directly impacts the UI design process all the way to development. If you are at this phase, you already have quite some experience defining project timelines and understanding expectations for deliverables. You have gone through initial research and testing and design iterations and are moving onto A/B split testing, relooking UX and UI patterns, and identifying where they affect conversions, user drop-offs, and where consumers have misunderstandings of your product offering. Other areas you might investigate are re-visiting the experience the product offers from a visual design and interaction point of view. This is sometimes referred to as emotional design. You may also look into internationalization vs. localization in regards to growth or expansion, be it for the businesses or your products as well as addressing understated needs for customers or where the platform falls short technically. Change is inevitable, and integrating advancements in usability and performance architecture or accessibility is crucial to your product’s survival and relevance. Collaboration with creative/visual designers to incorporate the visual identity and tone into features. Once you have gone through the arduous process of working out technical requirements and are ready to hire a UX designer, it is important to go through a chemistry session with your UX design candidate(s) and get on the same page. Their ability to produce work is one thing, but to truly succeed, you also need to be working with someone you can trust to defend your purpose and intent through the work they produce as well as have the experience to be able to best define requirements, governed from true insight and led by shared values. There will be a lot of custodians in place, from technical to business as well consumer, so it is one thing having a genius, but if they have no connection to the product, customer, or colleagues, then your boat may end up in the docks. “Furthermore, in regards to the challenges presented, what will you be most comfortable in taking on and solving?” This is a key takeaway as most will only address their perceived strengths and it is crucial to also understand from the get-go what they might not do well as well (in respect to time and resources) and mitigate those risks from the start. “How will you communicate best—Zoom, Slack, Skype, Trello, etc. ?” Always best to make the bed so that you are ready to kick off within the right channels. “What are you most excited about accomplishing with this project?” Also identify categories the project falls under so you all know what you’re getting into—Is it eCommerce, SaaS, Onboarding and Support etc.? 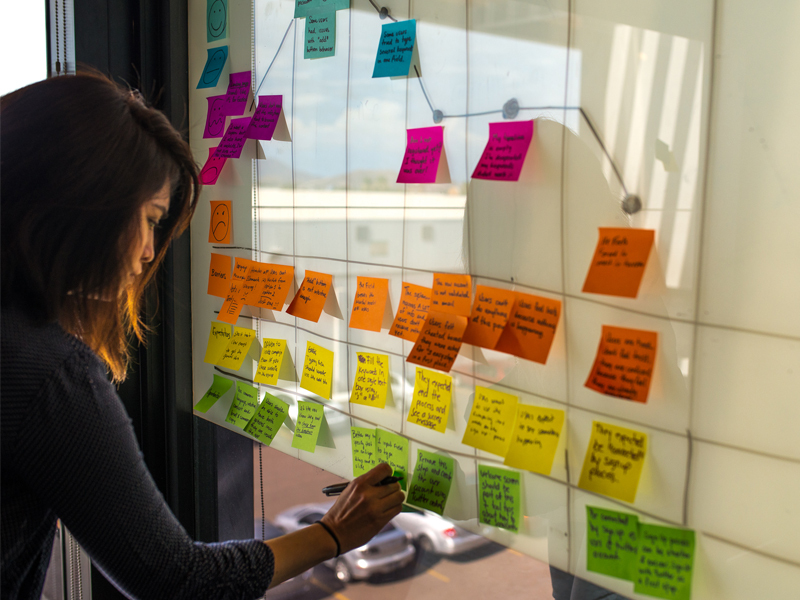 At this point, you have defined what you need and who you would like work with in your product’s journey, so the next steps to recap and address are simple although important to have bedded down. Once final expectations have been set and confirmed, your next step will be to get back to your matcher from the Toptal Core team and finalize legal as well as terms of service and set a starting time for your project. From this point forward, you’re good to go, and support is always around when you need to redefine terms or commitment lengths. Your matcher will be by your side to help create the best experience possible along with your new UX design partner. Iteration/Iterative development: Iterative development is a way of breaking down software development into smaller pieces. An iteration in the context of Agile development is as set period of time (usually between 1 and 4 weeks). MVP: MVP means minimum viable product. It’s a way of developing a new product (e.g., a website) with acceptable features to suit the users. More features are only developed after considering feedback from the initial users. Unit Testing: Unit testing is where parts of an application are tested to find out if they are good to use. Unit testing can be done manually but is often automated. Check out Ruwix to learn the solution of the Rubik’s Cube and other twisty puzzles like Pyraminx, Square-1 etc. See also: Toptal’s growing, community-driven list of essential UX design interview questions.